Extreme weather conditions this year are bringing more tragic news than ever before. This week Brooklyn residents were shocked to hear that a pregnant woman, out shopping with her husband, was hit by a snow plow in Brooklyn New York. While the mother could not be saved, doctors were able to deliver her almost full term baby boy. 36-year-old Min Lin was 8 months pregnant when she was out shopping at a Brooklyn supermarket with her husband on Thursday. The couple was loading groceries into their car in the parking lot of a Sunset Park supermarket when they were hit by a bobcat that was backing up as it cleared the lot. The mom-to-be reportedly went into cardiac arrest before she was taken to the Maimonides Medical Centre where she passed away. Doctors, however, performed a C-section and were able to save her baby boy born 6-pound, 6-ounces. Her husband was unhurt. According to a hospital spokesperson, the baby was in critical condition in the neonatal intensive care unit. It could not be said if the baby’s condition was because of the accident or because of the preterm delivery. Meanwhile neighbors of the family were horrified to learn about the accident. She said the couple already has another son. Some living in the same neighborhood were more verbal about their complaints against the privately owned snow plough. Linda Perez a neighbor said she had complained to the supermarket previously about the driver. According to reports however, the 45-year-old driver has not been charged and has cooperated with the investigation. 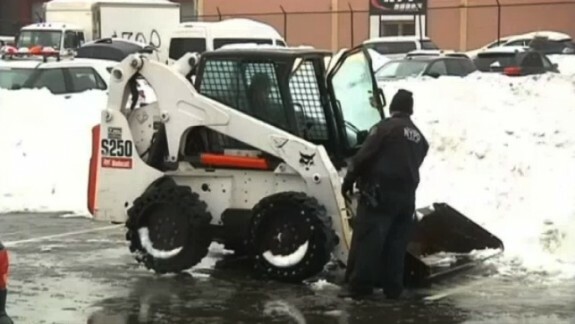 Only last week in a similar incident a 73-year-old man in Brighton Beach was struck and killed by a backhoe clearing snow. The cold snap has been blamed for the death of more than 20 people and has grounded thousands of flights.